On the right is the J-Head Mk IV prototype nozzle. For the sake of comparison, I have a J-Head Mk III-B on the left. 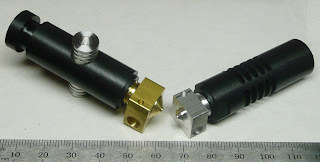 The nozzle itself was machined out of a piece of 13mm x 13mm square 2024 aluminum rod stock and is much smaller and lighter than the brass nozzle on the left. The entire unit, with the heater resistor and thermistor, only weighs 15.3 grams. Replacing the aluminum heat-sink, used in the Mk III and Mk III-B, are milled grooves in the PEEK. In addition, the PEEK has been drilled out to form what could be described as fins with supporting struts. At the root of of each fin there is only 1mm of PEEK between the PTFE liner and the outside air. The goal is for the fins to not only provide some cooling but to also act as a thermal break. While PEEK is not a good conductor of heat, it is hoped that the fins will be adequate to eliminate the need for the aluminum heat sink. I will be shipping this prototype out soon so that it can be tested. 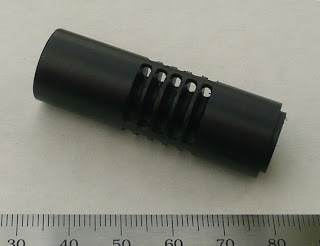 If the Mk IV prototype is successful, I may be able to lighten the nozzle holder even more in order to approach a maximum weight of 14 grams. Does that new peek scheme allows long prints without some active cooling ? Anyway, one less part is always nice. While I'd like to eliminate it, there will still need to be a cooling fan setup to blow air through the PEEK fins.